At approximately 11:03 AM Eastern Standard Time today, a monumental breakthrough occurred for human space exploration. 317 million miles away from Planet Earth, far beyond the reaches of Mars and even the Sun, Comet 67P Churyumov-Gerasimenko became the site of mankind’s first ever ‘soft-landing’ on a comet. 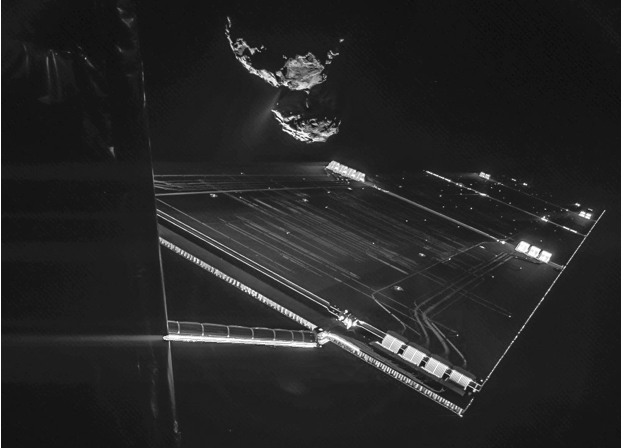 At a landing site codenamed ‘Agilkia’, Rosetta’s aptly named ‘Philae’ (after the island in the Nile river where archaeologists learned how to decipher Egyptian hieroglyphics) landing craft touched down upon the icy comet. Despite a failure of a small thruster that was installed to aid in harpoons that would attach the craft to the surface of the comet, Philae seems to be resting still on the comet, despite the relatively light gravity of its surface. The sheer difficulty of this mission cannot be underestimated. Hours before landing, scientists had estimated that the mission had approximately a 75% chance of landing safely on the surface (which leaves a 1/4 chance for complete disaster). The scope of this mission is important to recognize too; this space craft was launched from Earth on March 2nd 2014, and it took over 10 years for the craft to finally rendezvous with the comet while on its orbit around the Sun (it reached the comet of the sixth of August and has been carefully orbiting it ever since). The cost of the mission itself is estimated at $1.3 Billion (American dollars), and the cargo weighs only 220 lbs and is roughly the size of a washing machine. The importance of this achievement, and the scientific experiments that will take place on the comet, far outweigh the costs. Philea will drill a small hole into the comet, analyzing the composition of the materials present in the inner and external surface of the celestial body. Considering that scientists believe this comet to be directly made up of the materials exposed during the creation of the Universe roughly 4.5 billion years ago, scientific analysis may gave us new insight into the formation of our early solar system as well as give us a peek into the formations of our creation. I could write days on end about what this means for the future of space exploration and of our species, but I’ll try to condense it as much as I can. When we undertake missions such as these, full of risk yet full of potential reward, we’re affirming to ourselves that we are a species who is committed to pushing the limits of our own understanding of our world and of the Universe. Though the successes of scientific discoveries may not break the headlines quite like celebrity figures of pop culture do, each small step and each potentially monumental breakthrough pushes us closer to a day when we finally answer those striking questions that have puzzled humans for hundreds of generations; Why are we here? Where do we come from? Does life have a purpose? Certainly Philae will not even come close to answering these questions, but it will bring us closer to that oncoming peak of human understanding. After a difficult span of two weeks involving rocket explosions and accidents involving commercial space aircraft, I’d like to send my heartfelt congratulations to the European Space Agency and the ESA team in Damstadt, Germany on this breathtaking achievement. This is undoubtedly a success for human civilization that will be told in history books for centuries to come.